Posted on 28, June 2016 by EuropaWire PR Editors | This entry was posted in Finland, Industrial, Transportation & Logistics and tagged Adani group, India’s largest private multi-port operator, Royal IHC, trailing suction hopper dredgers, Wärtsilä. Bookmark the permalink. HELSINKI, 28-Jun-2016 — /EuropaWire/ — Wärtsilä has won an order for two new 8000m3 trailing suction hopper dredgers being built for the Adani group, India’s largest private multi-port operator. 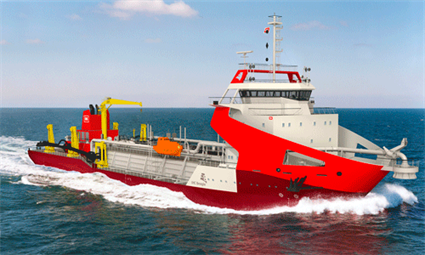 The vessels are the first of a new IHC Beagle series designed by Royal IHC (IHC) of the Netherlands. IHC will also build the dredgers. The contract with Wärtsilä was signed in February, 2016.